1. I know I'm supposed to be knitting presents, but I accidentally left my spinning wheel out (with the band thingy off so it doesn't stretch out) after the last time I had a chance to use it - in September. So in the midst of some distress the other day, I kind of caved. Literally just kicked off my boots and sat down. 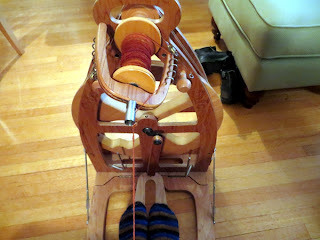 I love spinning so much - and it's true that it really calms you down! 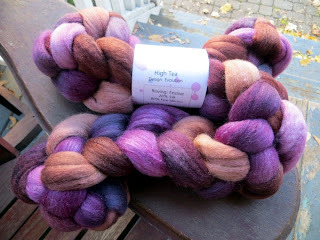 ... it's a silk blend, and - you know, mostly purple. Even though I discovered I have a ton of Blue-Face Leicester fiber from earlier clubs, I think I might have to spin this first, assuming I ever finish the Stoddart sock stuff. 3. Timewaster alert: Been reading about Toronto in the news lately, or hearing about an unfortunately prominent resident on every. comedy. show. in the US? Well, try living here. The other day I realized I was losing up to two hours of creative time every day just combing through the profusion of news stories, hoping against hope to find one that announced a criminal charge or a voluntary resignation or, ideally, both. Computers: a crafty person's best friend and worst enemy. 4. I spent Sunday's gift knitting time illogically, by reviewing the problem that stopped me working on any of the three pairs of socks I started knitting in the spring. At first I thought there was one: not knowing exactly how far to knit before starting the toe. Then I remembered there was a second: none of the needles I was testing are any fun to knit with long term. And then I discovered a THIRD - a hole in one sock's leg, near the cuff! It's as though a moth chewed through the yarn of two stitches, one above the other, but I couldn't find any other evidence of Moth and I dimly remember an accident with scissors that I may have blocked out, but that might be wishful thinking. Anyway I'm not posting a picture of the hole today because it's still freaking me out. Maybe when the rest of the socks is done and I figure out how to darn it because I am not ripping out an entire foot, heel, and leg to get back to round 10 of a sock. 5. One evening last week I thought I'd avoid the computer, and just sit with an audiobook and work on Wayson's brown cowl because the fabric I'm making feels so nice in my hands. Almost immediately I realized I had been asleep for several stitches, and a short time after that I noticed the audiobook was a whole chapter ahead of where I'd consciously left off. I don't seem to have knit during the second nap though. I'll have to find elves to make that sort of thing happen I guess, or stay awake more. 6. Lately I've been thinking about Twitter, mostly because I keep reading about it. It seems to me the good tweets are the ones that are funny, or news update-y. What do you look for in a good tweet? Maybe the best tweet of all is the one you don't read because you are gift knitting. 7. It's really cold out and I'm really grateful to have lots of warm, mohair blend, boot-weight socks to wear, but I can't help thinking of the four pairs (four!) I knit in the summer that still need their ends run in before they can make themselves useful. I'm focusing instead on the three I already have and on wearing them in swift, laundry-fueled rotation so as not to put aside any more gift knitting. 8. Yesterday I wore (among other things) a short skirt and leggings to run errands all over the place on public transit, and in spite of the current cold snap I was plenty warm enough because I also had my black wool legwarmers pulled up over my knees. This does not seem possible. But it does make me want to finish off the bottom cuff of my bright stripey legwarmers. 9. Finishing more knits for myself is no way to finish the gift knitting. 10. I looked at the calendar: as of this morning, there are really only 3 more viable weeks in which to finish my personal gift knitting, and I'm pretty sure I just spent several days looking at unfinished socks and falling asleep over a cowl that isn't even for Christmas. Good thing I caught two of the three episodes of The Bletchley Circle the other night because that show netted me a couple of inches of gift sock. 10 things! and here's an 11th - I'm going to shut down the computer now and not look at it again for at least three hours so I can get something productive done* on my day off. Wish me luck and I'll see you tomorrow. * and by productive, I don't mean laundry or dishes or general cleaning tasks. Naps count though because yay, sleep! Erika, you'd love Clara Parkes' 'Knitter's Book of Wool' (I also love her 'Knitter's Book of Yarn', which covers non-wool fibers.) Another excellent option is 'The Fleece and Fiber Sourcebook' by Carol Ekarius and Deborah Robson. The level of detail and great illustrations in that one are amazing!